Integra: Put that trash away. How did you get it? Heinkel (thinking): I’m worried about Yumiko…normally she’s so calm and passive. Yumie is supposed to be the aggressive one…I suppose that doesn’t mean Yumiko can’t be more assertive. Alucard: Trash? Master, this is a page from the novel with which Agent Paper attacked. Yumiko: How dare you call Sumiregawa-sama’s work “trash”! Heinkel (thinking): Still — that is not normal! Integra: Whether or not this is Wells’ objective, there is no way that he can succeed. Time travel is logically impossible. Still, if he has mechanical abilities, he may have created something else dangerous. Wells: They’re close. I thought the Morlocks would’ve bought me more time than that. Integra: …Alucard, are you listening? Shoujocard: Come on! Come on! hurry! Regenerate your legs and attack me! C’mon! I see! *sob* You’re just like all the other boys! It’s because I’m fat, isn’t it? Well, fine! I don’t care any more! I’m just going to eat and eat until I feel happy again! Hey, what do you know…I feel better already. Nenene: We have to protect Sumiregawa-sensei! Heinkel (thinking): Also, we got a call. Anderson (flashback): Something is up in London. Since you’re here, see if you c an find Hellsing. Seras: What else could Wells be doing, do you think? Yomiko: Wells is building a time machine! To save time the following strip will be presented in stick-figure vision. Integra: Is that all that evil-Wells can do, then? Make Morlocks? Yomiko: For example, it seems he can also give the Morlocks guns. Yomiko: They’re from The Time Machine — one of the future forms of man. There are two: the sweet, angelic “Eloi” and the brutish Morlocks. Seras: Didn’t you say Wells was a socialist? You’d think he would right something where the rich get screwe…. Integra: The Eloi are illiterate idiots. And the Morlocks eat them. Yomiko: These aren’t I-jin. They’re probably created by the I-jin Wells. Integra: How would this make sense as an ability for Wells? Maddie came up with this joke after we’d both read The Historian. Integra (thinking): I’ll just address this to Sir Penwood, and…hello, what’s this? It feels old…and all of the pages are blank. There’s something in the middle? Helena: Go read The Historian, by Elizabeth Kostova. It’s a richly detailed, lovely, and worthwhile book. Seras: What are these things? Pip: How should I know? I’m not the monster expert! Seras: Well, they’re not ghouls! 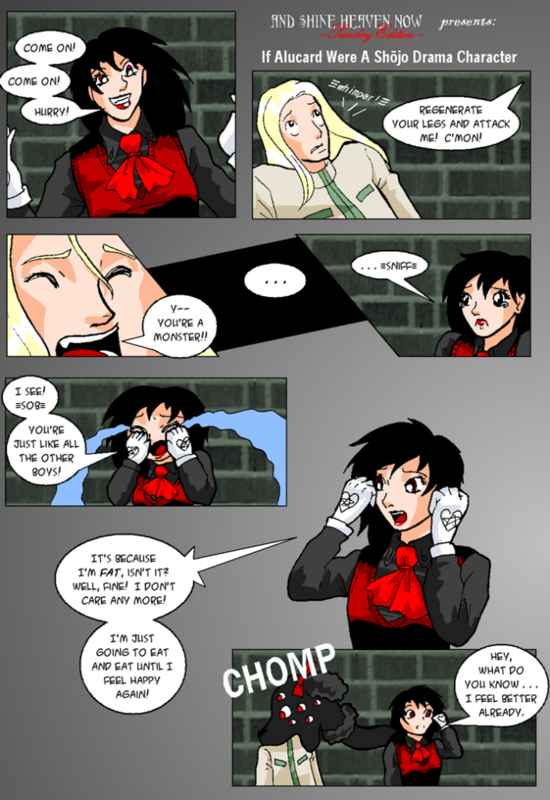 Alucard: Very astute, Police Girl. Duck.